Sixty-two year olds still constitute the largest single group of new applicants every year, regardless of age. That’s why the significant decline in their application rate is notable. Those who sign up for their Social Security checks when they first become eligible – within days or weeks of their 62nd birthday – are known as “early claimers.” People with physically demanding jobs are more likely to do so, because of health problems or unpleasant and exhausting work. 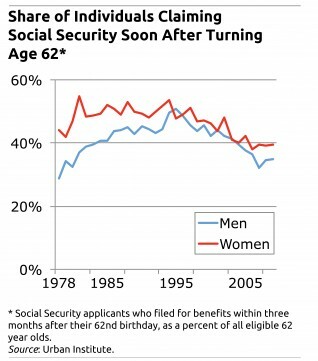 But filing for Social Security benefits prior to reaching full retirement age carries a cost for individual retirees. Monthly pension checks are reduced to make up for the fact that early claimers will receive benefit checks for more years of retirement. During the Great Recession of 2008 and 2009, applications for benefits spiked, due to a combination of the baby boom demographic bulge and, according to research published recently by Boston College’s Center for Retirement Research, the economic downturn that threw millions of Americans out of work. 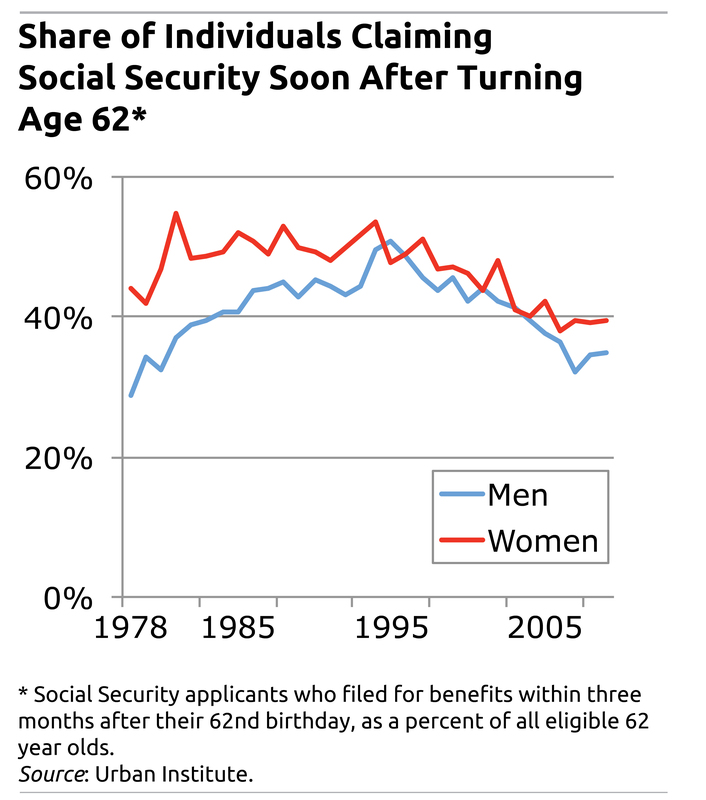 Early claimers of Social Security retirement benefits “use[d] the Social Security system as income insurance during downturns,” concluded the paper, by Matt Rutledge, research economist, and Norma Coe, associate director for the Center, which also sponsors this blog. The Center and the Urban Institute are members of the Retirement Research Consortium. During the recession, men with no more than a high school education were more likely to file, Johnson said. But he considers the surge in Great Recession filings to be an interruption in a tendency for people to file later, as older people live longer. Post-2009, filings again declined, he said. Full disclosure: The Urban Institute research cited in this post was funded by a grant from the U.S. Social Security Administration (SSA) through the Retirement Research Consortium, which also funds this blog. The opinions and conclusions expressed are solely those of the blog’s author and do not represent the opinions or policy of SSA or any agency of the federal government.